Product description: In celebration of the 25th Anniversary of Sublime’s release of their iconic album “40oz. to Freedom”, Sublime contacted AleSmith Brewing Co. to craft this unique brew. Sublime Mexican Lager is a thirst-quenching, 5.2% ABV twist on a traditional Vienna-style lager highlighted by a grainy, malt-forward sweetness and easy drinkability. It’s clean, crisp and balanced with a smooth finish. Cheers! 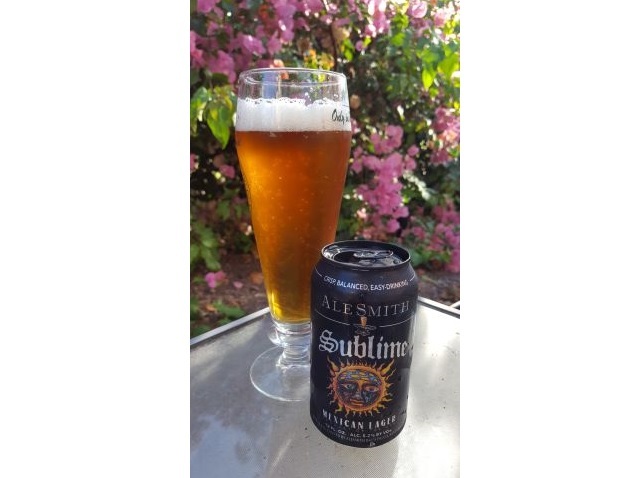 AleSmith Brewing – AleSmith Sublime Mexican Lager – 12 oz. can poured into a pilsner glass – 5.2% abv. 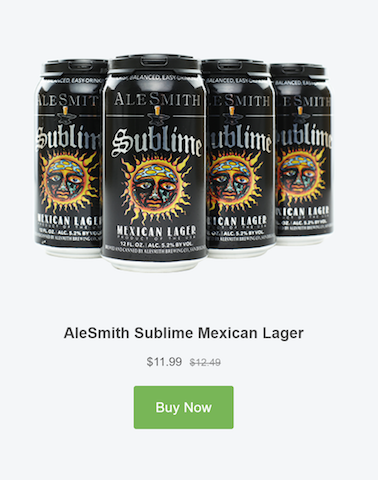 Originally released in 40oz malt liquor bottles as a homage to the Long Beach-based band Sublime’s debut album, 40oz to Freedom, AleSmith has recently started distributing canned six-packs of their Sublime Mexican Lager. I picked this up for $12 a six-pack of 12oz cans with a canning date of 7/28. So I’m sampling these a little over two weeks post packaging. The can has excellent label design with the iconic anthropomorphized sun from the original 40oz to Freedom album artwork. This is also the first can I’ve ever seen with a completely black lid – pretty badass. Into a pilsner flute, this beer is darker than expected. It’s a clear, lighter amber with yellowish foam. Powerful carbonation is a lovely sight in the tall glass. The aroma brings sweet candy corn, corn flakes cereal, and lemon soap. It’s not great at first. The flavor begins so sweet it’s like eating an orange sherbet push pop. Then there’s an unexpected mid-palate of soupy rustic grain and flaked corn that is actually not bad. The beer then finishes with some lemon acid. Obviously, I didn’t get a great first impression of this beer, but I had five more to sample over the course of the week so I tried them in a variety of vessels and at different temperatures. Hint: do not add lime to it – bleh. I grew quite fond of this beer over the course of the week. With Mexican Lager on the label and sun artwork, I’m thinking beach and I’m expecting Corona the whole time. But this is more like Negra Modelo. I looked up how other craft breweries in the US have decided to interpret Mexican Lager as a style, and at least Oskar Blues (Beerito) and 21st Amendment (El Sully) have done them in a similar fashion: Vienna Lager with the latter also using flaked maize as an adjunct as well. Well, I can’t confirm online that this beer has corn in it, but I would bet that it does. Other breweries like Great Lakes and Epic (UT) took different approaches with Epic’s Los Locos being a pale lager with sea salt and lime juice added. That’s more of what I was thinking prior to drinking the Sublime. What I ended up loving about this beer was the depth of rustic grain character and appetizing corn addition (maybe that’s in my head). It’s rich and medium-bodied with a dark breadiness that is balanced by slight tartness and a ridiculously long lactic, sourdough bread finish that lingers for several minutes. That’s where the magic happens. Amber corn lager does not sound refreshing by any means, but here it is. My main knock on the beer is the intense sweetness at the front, but it ends up working well after you’ve gotten through some of the can. Even the aroma improved in subsequent samples with caramel cake and maple waffle dominating. The more I tried of this beer, the more I liked it. I was skeptical at first and really the first few sips were not super pleasant. But the beer is well-constructed and does exactly what it set out to do. I think it makes a fantastic summer beer even with its Vienna lager, malty base. Drank straight from the can at the beach seems to be this beer’s calling in true Long Beach fashion. I’m not sure how this beer will fit into AleSmith’s portfolio in the future, but since it is now distributed in 6-packs and not just the special release 40oz malt liquor bottles, it seems AleSmith has seen its market popularity and is capitalizing on it. If you’re wanting to try something totally different in the craft beer world, give this a shot. It may surprise you as much as it surprised me.